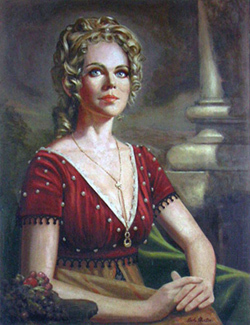 I wanted to let you all know I've decided to make copies of my Angelique portrait from Night of Dark Shadows available to buy. I recently had the original scanned to send a copy to Lyndhurst for their Halloween celebration and it's been on display there throughout October. The quality of these replica prints is superb. When reprinted on canvas using the Giclee process, they are identical to the original and look like a real oil painting. For more information and ordering details, visit the Store. Night of Dark Shadows has just been released on DVD and Blu-Ray and is now in stores, along with the Johnny Depp Dark Shadows movie. Look out for them! Just received your book 'Angeliques Descent'. Thank you for the autograph to my mom, Avis. She is going to be so surprised. We are both big fans. I will be ordering another book in the near future, one autographed to me. I do wish there was a way I could do a meet and greet with you as I will be visiting San Diego in January & February. It would make my vacation. Just thank you again for the signed book. It is greatly appreciated. Have a wonderful day! Thanks so much, Betty Jo! IS there an email or number for store front? Can You Please let me know if you have send the item I send a check for? I have posted on here before but I thought I should again. I recently finished Angelique's Descent and absolutely loved it, your writing is one of a kind and you know how to keep a reader hooked and on the edge of their seat. I am about to start Dark Shadows: The Salem Branch and excited I know it will be fantastic. I have begun to collect Dark Shadows collections for the past few months and hope to collect more. My favorite character is Angelique... of course :) you are wickedly evil as Angelique and you are very passionate about your work it shows through your acting. I would be amazing to meet you one day, that would be a dream come true. I am a huge fan! Since I was 10! Now 55, still watching all my vhs!!! I love the show! I have received your books! I ordered from Amazon, so I didn't get them signed :( I was wondering if I send them to your publisher with return postage if you can sign them for me? You can send the books to me and I will sign them and return them to you. Send $5.00 or a stamp addressed mailing envelope. Or see my web site store for autographed material. I forgot to ask! I will be sending 3 books to you once I get New Moon Rising.....so will it be $5.00 each book to send back? Oh, only Amazon has your new book? If you send the books to me to be signed, I will return them to you. Please add postage.